Arlington Soccer Association also asked teachers and administrators from the participating schools to comment on any changes in student behavior or academics witnessed since the inception of the Real Madrid program. Soccer has been a huge motivator in my class. The [students] know that they have to have good behavior and turn in all of their homework and assignments to be eligible for soccer. 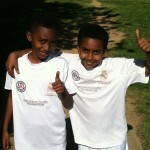 Soccer reinforces that they are responsible for their materials, behavior, and schedule. Soccer gives students that extra motivation to really work for a goal that they are passionate about and it is instant reinforcement when they get to go each week and be rewarded by their participation.